These powerheads are the perfect replacement powerheads for any Beam, Eureka, or Electrolux square neck powerhead. They are all manufactured by Electrolux, the manufacture of Beam, and is similar to the Beam "Q" powerhead. Indicator lights on the powerhead to show the height level you are operating at and a circuit breaker indicator that lights up if the machine is stalled or jammed. 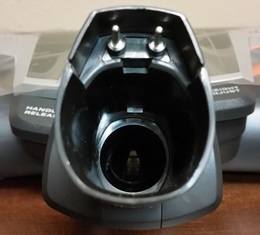 A circuit breaker feature that protects the motor in your powerhead if you pick up something you shouldn’t. 14-inch wide deep cleaning brush with dual edge cleaning. This EL11A powerhead is the perfect replacement powerhead for any Beam, Eureka, or Electrolux square neck powerhead. It is manufactured by Electrolux, the manufacture of Beam, and is similar to the Beam "Q" powerhead. 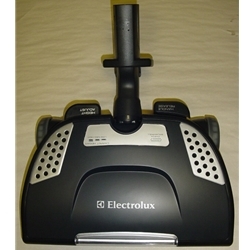 This Electrolux E11A powerhead is one of the quietest electric powerhead available. Please note that this powerhead can only be used with the exclusive Electrolux, Beam, or Eureka Square neck wands. Note the Inside of the socket. This EL12A powerhead is the perfect replacement powerhead for any Beam, Eureka, or Electrolux square neck powerhead. It is manufactured by Electrolux, the manufacture of Beam, and is similar to the Beam "Q" powerhead. This Electrolux E12A powerhead is one of the quietest electric powerhead available. Please note that this powerhead can only be used with the exclusive Electrolux, Beam, or Eureka Square neck wands. This EL13A powerhead is the perfect replacement powerhead for any Beam, Eureka, or Electrolux square neck powerhead. It is manufactured by Electrolux, the manufacture of Beam, and is similar to the Beam "Q" powerhead. This Electrolux E13A powerhead is one of the quietest electric powerhead available. Please note that this powerhead can only be used with the exclusive Electrolux, Beam, or Eureka Square neck wands. This EL30B powerhead is the perfect replacement powerhead for any Beam, Eureka, or Electrolux square neck powerhead. It is manufactured by Electrolux, the manufacture of Beam, and is similar to the Beam "Q" powerhead. This Electrolux E30B powerhead is one of the quietest electric powerhead available. Please note that this powerhead can only be used with the exclusive Electrolux, Beam, or Eureka Square neck wands. Unlike other Power Heads the EL30B has the BrushrollClean Technology. Just a quick step on the button and it removes hair and fuzz from the brushroll. Contains LED lights, and a 4 position height adjustment. Broke way too soon. Also, "costs more than I paid for the whole vacuum" !!!! !